We hope you enjoy these all-new photographs that show the present condition of the Field Station facilities on the top of Teufelsberg Hill in Berlin, Germany. It is plain to see that everything that is there has suffered an intentional assault by tresspassors who mean to destroy all of it. Wind and rain could not have done this damage in the time since the Field Station was abandoned by the Western Allies 1992. It takes winds that are higher than 100 miles per hour to tear the skin on the radomes. There have been no earthquakes or tornadoes in Berlin since that time. Neither sun nor snow nor hail can inflict this level of destruction. All of the damage was done by vandals. These photographs were donated to FSBVG by Fritz Lowan, a Berliner who supports the saving of Teufelsberg and other important Berlin landmarks in history. The pictures speak for themselves. 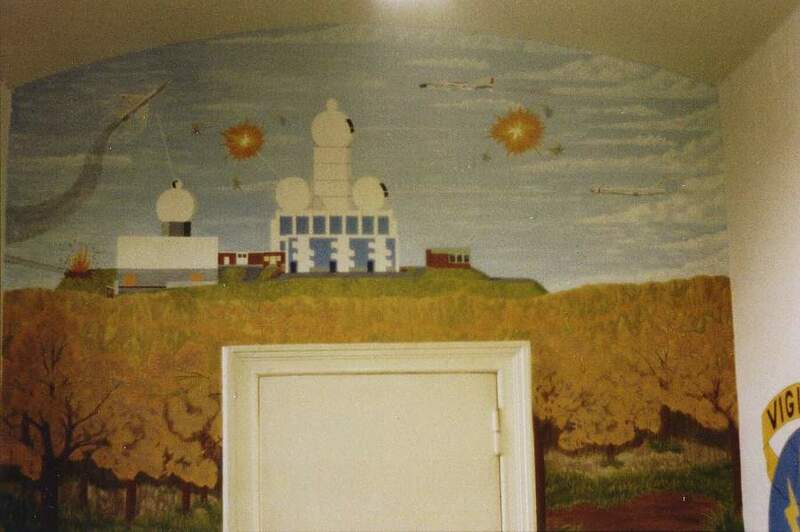 This is a photo taken in the late 1960's of a mural in the dining hall of Field Station Berlin's Andrews Kaserne. That barracks building is now the warehouse of the archives of the former east German DDR. The photo illustrates the firepower of the high powered anti-aircraft lasers mounted beneath the radomes on Teufelsberg. They were to be used against Russian jet fighters and rockets. As far as I know, they were only fired a time or two in anger. They were built to protect Berlin before we found out they were unnecessry because the USSR was a complete paper tiger. Of course, they were top secret. Some say they were back-engineered from alien technology from the Roswell, New Mexico, crashed alien spacecraft which is now housed at Area 51 in the good old USA. Others say we got them in a deal with the aliens for the return of the bodies of the crew of the spacecraft. Me, I'm not telling what the real story is. Of course, that's old technology now, since our latest versions are on our bases on Luna and Mars. Photo copywrite Frank Curran, 2008. Frank worked for US Army Field Station Berlin on Teufelsberg, 1972-74, as a secure voice person. He has resided in Gilbert, Arizona, USA, since 1990.